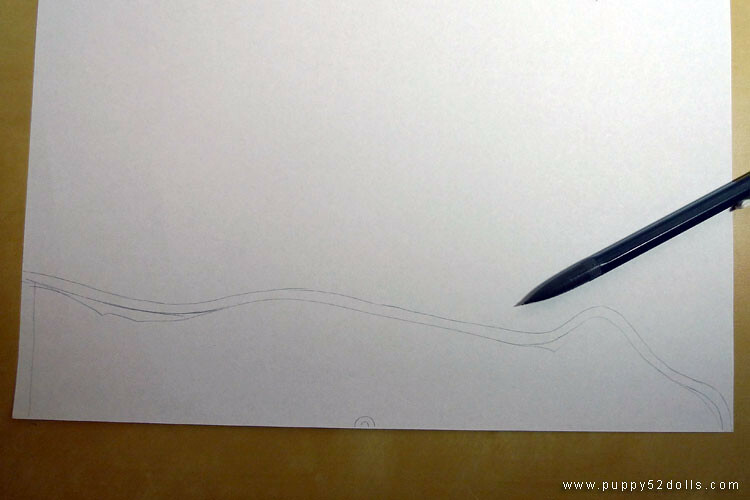 3) Smooth out some of the lines with the pencil, mainly behind where the knee is, and behind the heel. Add a 0.5cm seam allowance line overall, at this stage it is optional that you trace the final outlines with a pen, and erase the pencil lines. I skipped that ^^; If you do that make sure the ink is completely dry before the next step. 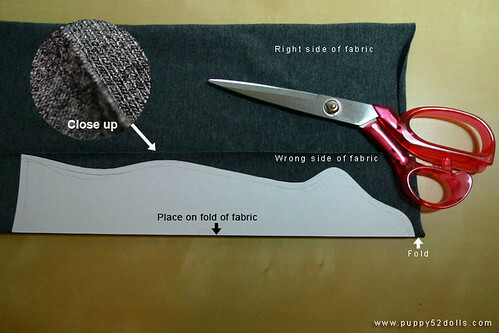 4) Cut out the paper pattern and place the longer straight part on the fold of the fabric, the “wrong” side of the fabric should be facing outside. 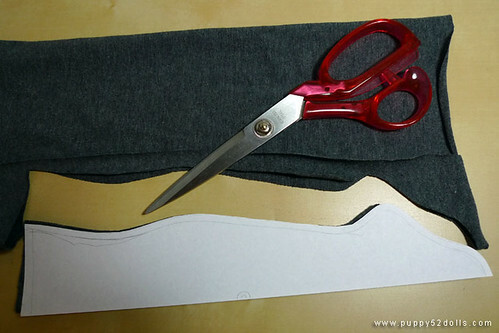 5) Carefully cut around the pattern with the scissors for cutting fabric. 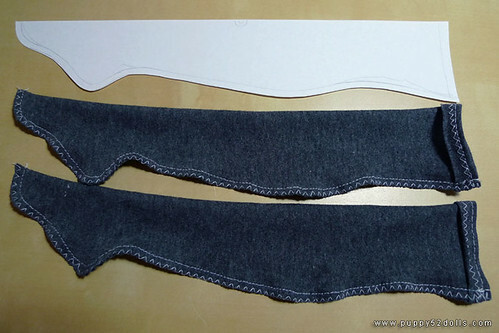 6) Fold the rest of the fabric again the same way (wrong side facing outwards) and cut another piece for the 2nd sock. 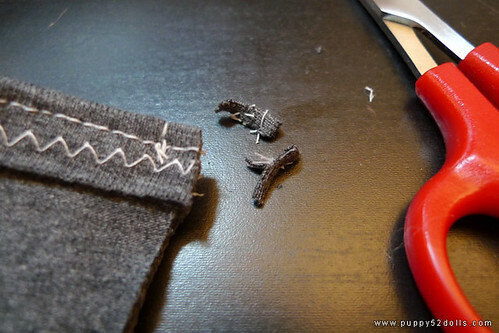 7) Sew a zig zag stitch along the “hole” of both of the socks. You can trim off the extra fabric near the end of the edge if you wish. 8) Fold in the edge of the socks where the zig zag is sewn into the wrong side of the pieces, sew a straight stitch along the fold. 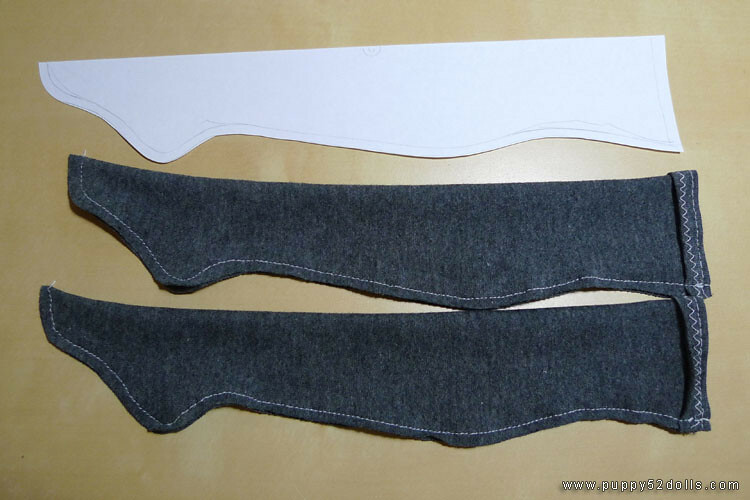 When done, it will look like this the piece on the bottom is showing the “right” side, the piece on top is showing the “wrong” side. 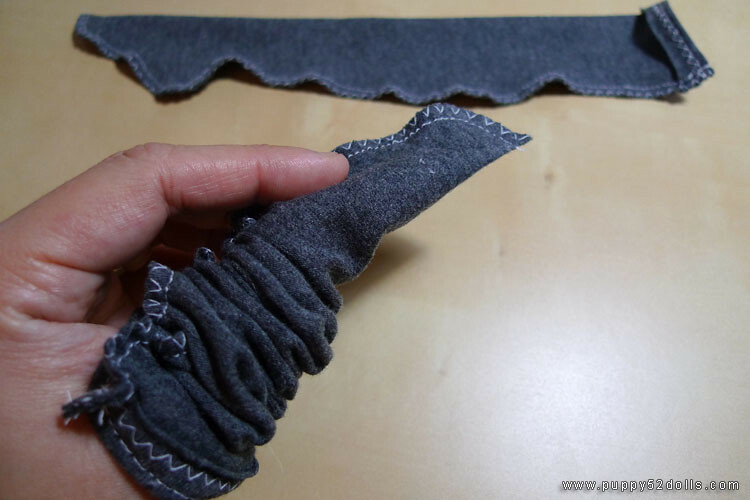 9) Take one sock, fold it with the wrong side facing out matching the end where the “hole” of the sock is, baste the part specified in the picture. 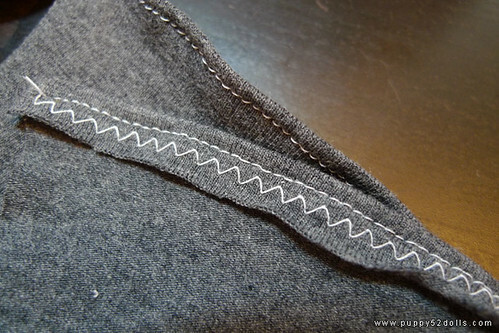 This part is actually optional but recommended to ensure that the edges match up when you machine sew. 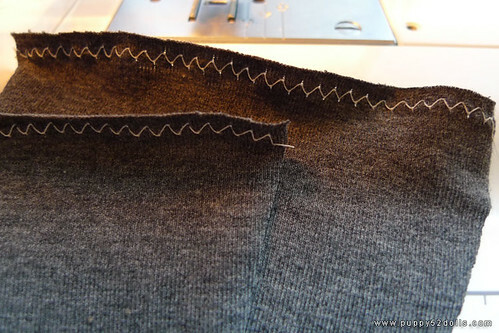 10) Trim off excess fabric at the edge to reduce bulk. 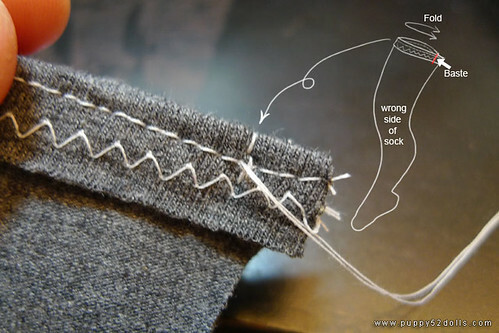 Do the same for the other sock. 11) Starting from the end where the sock is basted start machine sewing to join the sock. 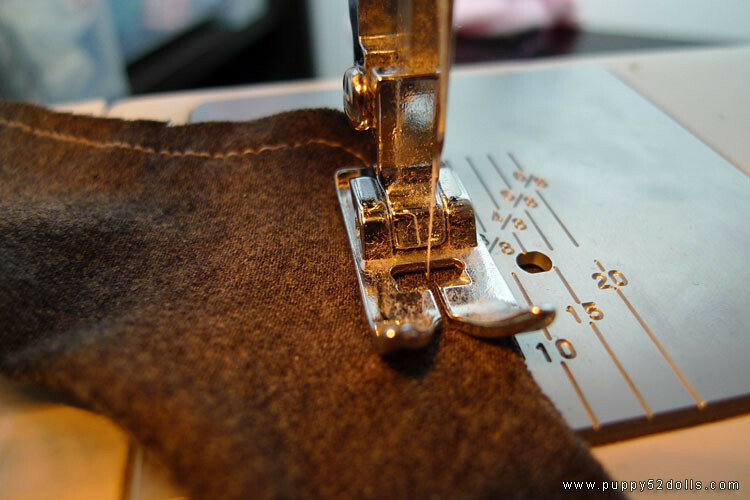 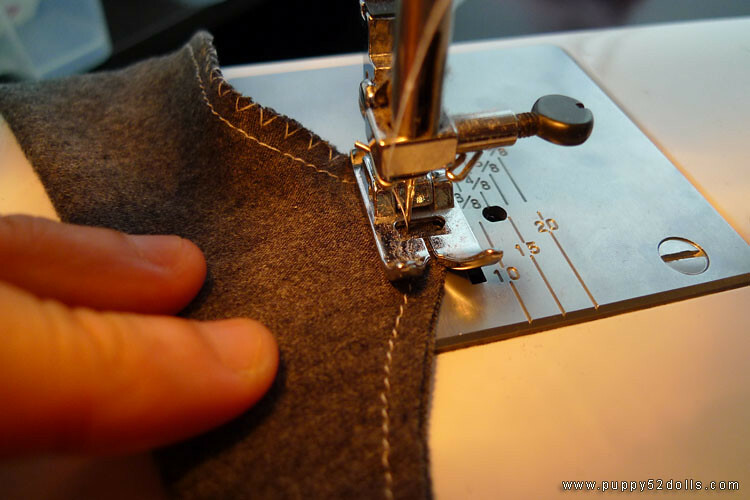 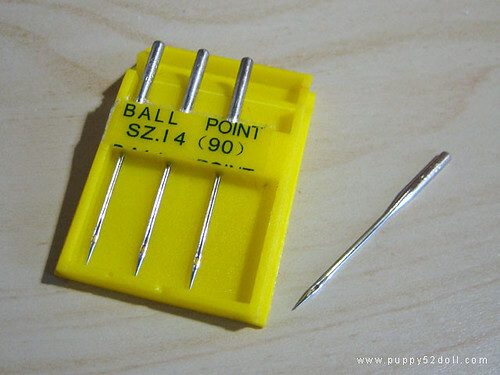 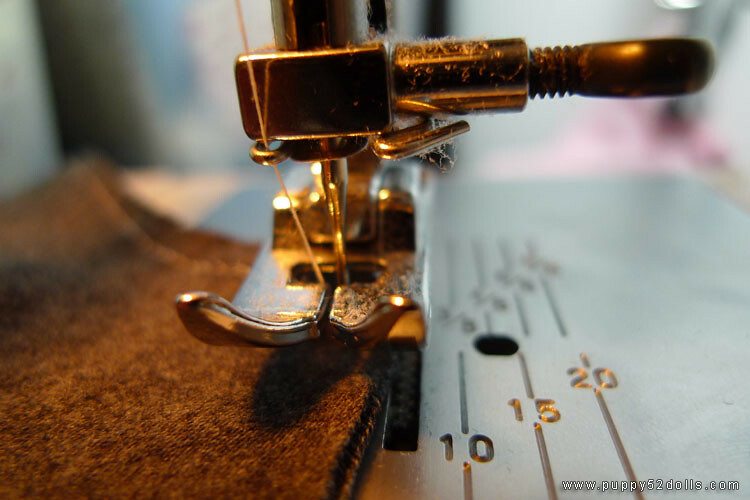 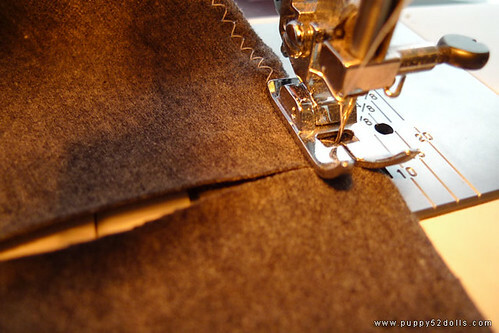 Use the hole where the needle is at the presser foot to gauge where you are sewing — which is about 0.5cm. 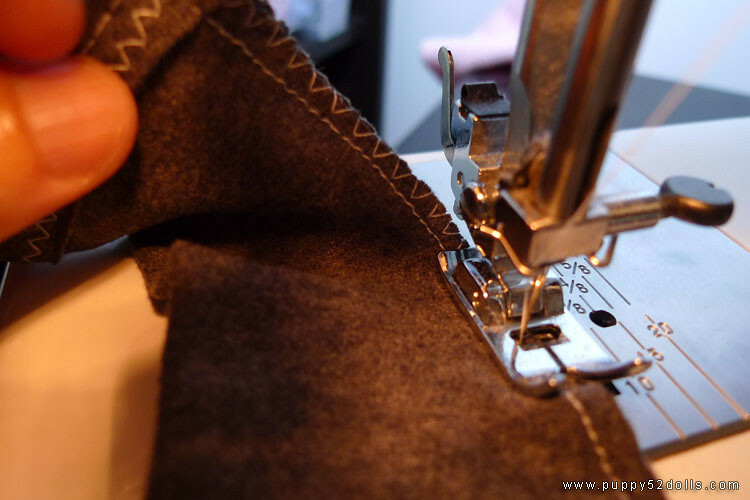 12) When sewing around the corners, go slow and raise the presser foot time to time (With the needle in down position), use your right hand to stop the machine or roll the needle into down position before lifting the presser foot to prevent the fabric from moving from it’s position. 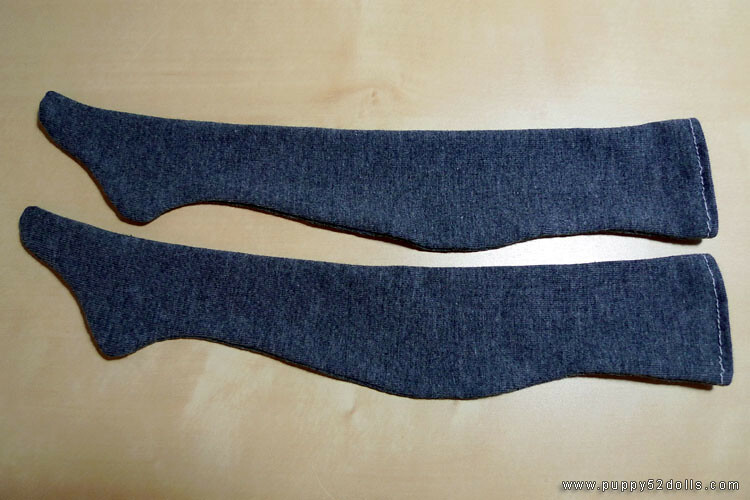 13) After the straight stitching completed for both socks, it will look as below, you can chose to turn the socks inside out at this stage and call it done, but I would recommend an extra step. 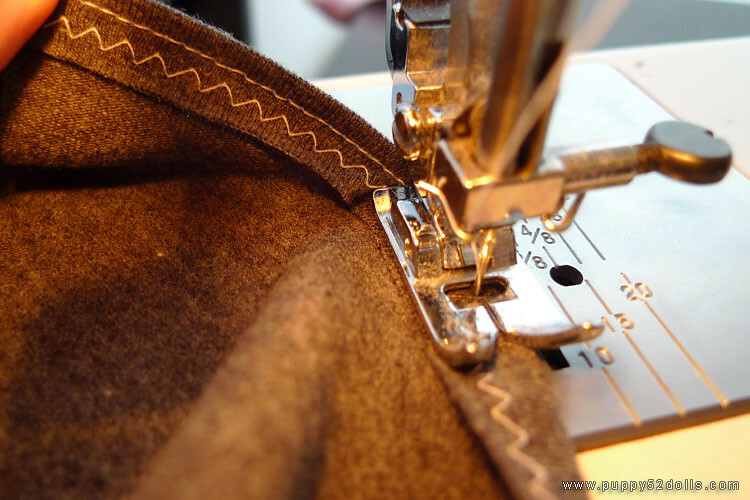 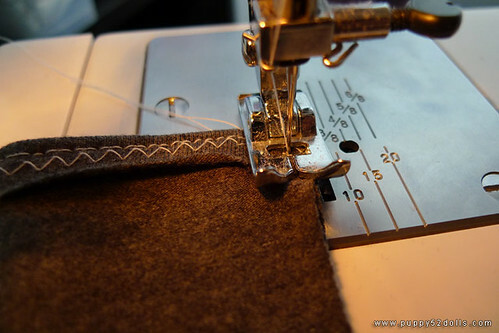 14) Using the zig zag stitch, finish the edges of the seam allowances. Go slow around the corners, and do the lifting of pressure foot (With the needle in the down position) when needed. 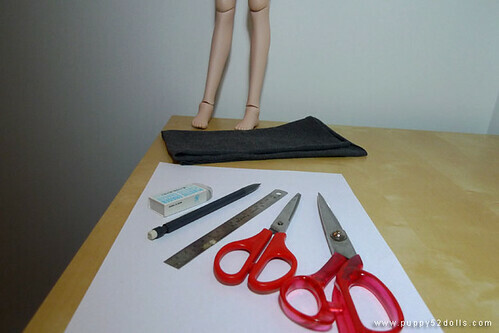 And yes, this is a pair of “zettai ryouiki” socks :P you can use a ruler to mark the pattern if you prefer shorter socks for your Dollfie Dream girls, or any other dolls you try to make this pattern for ^^/ For a few more Himitsu in a white pair of zettai ryouiki socks as seen below, you can check this past entry :3 Yum! 57 Responses to Tutorial: Dollfie Dream Socks – Printer Free Version! 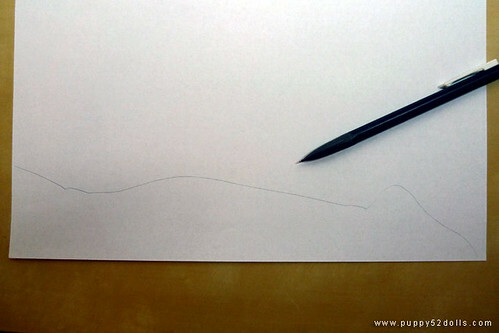 Thanks for your tutorial. 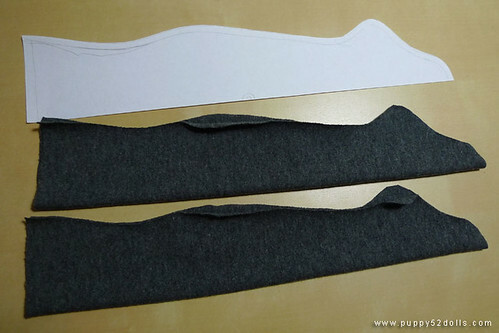 I am going to try and I will let you know.